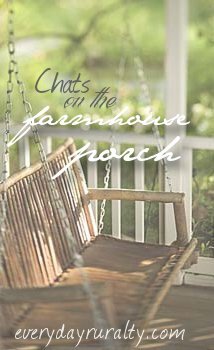 Homeschool on the Croft: On Patrice's Porch ... and Needing Therapy. On Patrice's Porch ... and Needing Therapy. I'm back on Patrice's porch, and oh boy, am I loving the Virginian weather! Yesterday, we got a wee hint of what summer in Virginia can be like - our temperatures here in Ness reached the heady heights of 70F, and we had almost no wind. It felt positively Mediterranean. My sister and her kiddos were with me for the past couple of days, so I dragged took her out to the peats yesterday to lift what had been cut a few weeks back. My sister and I are, erm ... different. Can you imagine me dressed this beautifully for the peats? In fact, don't answer that .... Can you imagine me dressed this beautifully at. all? Ever?? I just love spending time with my sister. Anyone who has a sister knows it's just such a gift. And thankfully, many who don't have a 'real' sister have been blessed with beloved friends who are like sisters. Anyway, despite my love for her, she doesn't appreciate my boots. 'Nuff said. 1. What do you think you would have liked most from my menu? Patrice, your menu looks amazing, but I'm going to go with the boiled new potatoes and butter. I am a real potato person and new tatties with butter are my ultimate choice. All the food looked amazing, though, and knowing so much of it was home-grown and home-made, would have made it all the more delicious. 2. Have you ever had an interesting experience with serving dinner guests? Oh dear me ... I'm not sure I can bear to recount this horrific experience. Were I not Scottish, I'm sure I'd still be having counselling following this day in my experience. It took place around twenty years ago, the Builder and I were living in Glasgow and we were still childless. It was Christmas and a couple who were friends of my parents asked us to join them and their family for Christmas dinner. And now I want you to picture the scene. The house is immaculate. The people are immaculate. The couple, in their 60s, are always immaculately dressed. They have two sons, who are both married and their wives are with them for the day. Yes, you guessed it - they are immaculate too. These ladies are petite, gorgeously dressed, and are, erm, well, let's just say they wouldn't be wearing my boots any time. Three immaculate couples. And the Builder and me. The table is covered in a crisp, white table cloth, and three red candles burn sedately throughout our meal time. Our meal is delicious and is served with no fuss, no mess. After dessert, our hostess brings through her home-made Christmas cake, covered in gorgeous white icing. As our hostess thinks about passing tea and the cake around, she decides to blow the candles out, lest they cause any damage. She gives a little whoo. Just a gentle puff. The flames flicker slightly, mocking her attempt to extinguish them. She tries again. Her gorgeously dressed, and equally sedate and ladylike daughter-in-law tries. A genteel whoo passes her lips. The flames barely notice. Enter stage left .... Moi. Whilst watching the little puffs, the slight flicker in the flames, and the still burning candles, I'm thinking, 'Well, that's not going to put out the candles'. Oh the flames were extinguished in a split second, but ... oh, horror of horrors. The deep red melted wax from the candles were everywhere. I mean EVERYWHERE. On the hostess' dress. On her daughter-in-law's dress. On the WHITE tablecloth. And ALL over the beautifully iced cake. Patrice, I am actually traumatized relating this story. I can feel the shame even now! I can still see the red splashes everywhere. And I can still hear the moments of silence following the ... the ... the event. I can feel the horror and I can remember the realization dawning on me on why these ladies had given genteel whoos. See ... that's why I moved back to the Croft. I was clearly made for these shores. Now, anyone have a number for a good therapist ... I feel I need one now. 3. What's your favourite beverage this summer? Erm, tea. Of course it's tea, Patrice! Whether it's January or July, my favourite beverage is always tea. 4. Do you ever have bouquets of fresh flowers in your home? Yes, I do, although they're bought in the supermarket, so I suppose 'fresh' is pushing it a bit. Catherine, from time to time, comes home with fresh flowers because she knows I love having them in the house. Right now, I have a vase of deep red roses in the kitchen. Dearie me, here we are on 'deep red' again. Quick, ask me another question! 5. Tell me something interesting. Please. Oh, I'm not sure how interesting it is, but DR will be 21 - yes, that's twenty-one - in a fortnight's time. We're planning a wee party for him and his, and our, friends. I've begun preparing food, and I've most certainly begun preparing mental lists! Last year, we had a BBQ in July and had a wonderful evening of food and fun and fellowship and singing. Our lovely American friends were here at the time. our peat campfire kept us warm. It was such a lovely evening, and some similar weather for this year's get-together would be wonderful. Unfortunately, one can't plan around weather in Lewis, so if the weather is unfavourable, we'll eat, talk, and sit inside, rather than outside. Either way, I'm sure it will be a fun time. Thank you for stopping by my Hodgepodge today! It is nice to meet you! When I saw that you are in Scotland, I had to visit. I have been reading the Outlander series of books, mostly about Scotland in the 1700s. My mother's maiden name is Cameron, and Scotland is a place I have always wanted to visit. I'm going to check in with you, now!! Happy Birthday to DR! What a great age! May he continue to seek the Lord in all he does and continue to grow in wisdom! Oh, yes...it is so fun to see the pictures from last year! I know my girl will see them and wish she was there again! You want to know what caught my eye? The stones around the campfire. They are beautiful! I am a rock girl, I pick up rocks where ever we go. I loved all that you shared, and am certain I've had something just as equally embarrassing happen at a dinner party, I become all thumbs when in those settings. Eeek!